Believe it or not, Patrick, Fleming, and I apparently never learned how to correctly tie a tie. Not that we're in an industry that demands much in the way of neckwear, but it's something that we took for granted. In the first episode of "Queer Eye for the Straight Guy" that we watched, Carson Kressley, fashion savant, demonstrated how to tie a tie for his hopeless subject in Great Neck. Our collective jaws dropped. We'd been doing it wrong for 26+ years and not a single straight soul had ever corrected us. We were sold. Five episodes later, we're still learning. Two years ago, in Boston's South End, a woman condemned her husband for his unkempt appearance. “Why can’t you look like them?” she asked, indicating several well dressed, groomed, and mannered gay men. The gay men, instead of lampooning the man, came to his rescue – complimenting some of his fashion and suggesting improvements. “What she needed was a queer eye for her straight guy,” observed David Collins, who witnessed the incident, as he relayed the story to his partner, straight producer David Metzler. "Queer Eye for the Straight Guy" was born. 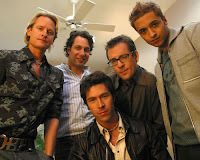 "Queer Eye for the Straight Guy" premiered on July 15 on Bravo, a small basic-cable network best known (previously) for "Inside the Actor's Studio". "Queer Eye," a hilarious unscripted lifestyle-makeover show features the “Fab Five,” a super-hero styled team of gay experts who transform one straight man in need of serious help in each 60-minute episode. The fashion victims, by the way, mostly submit themselves to the Fab Five's scrutiny, though straight subjects are occasionally submitted by girlfriends and wives. Straight slobs in the greater New York area beware. The show's cast, selected first and foremost because they were experts, not just because they were gay, is an exceptional team of professionals. Ted Allen, the show’s food and wine connoisseur, is a contributing editor to Esquire magazine, and coauthors the "Things a Man Should Know" column. Kyan Douglas, the show's grooming expert, has lent his expertise to TLC’s "What Not to Wear" and "While You Were Out". Thom Filicia, who manages his own sizable interior design firm in NY, has been noted as one of the top 100 American interior designers. Jai Rodriguez, the culture guru, stared in Rent and is a fixture on NY's club circuit. Finally, fashion elite Carson Kressley, the team's one-line dealing leader, has lent his design expertise to the likes of Ralph Lauren. Of course, the success and instant popularity of the show can not be attributed solely to their "queer eye". The show's greatest assets are its good sprit, its hilarity, and its constructive methodology. They don't destroy the straight guy or rebuild him "gay". And Bravo spends $1,500 to $10,000 an episode for the makeover (depending on the income of the straight subject – they're trying to create a lifestyle the straight guy can maintain). What's more, the miracle transformation is somewhat of an illusion. While the show appears to take place over the course of only one day, the actual makeover lasts as long as three days, during which time the straight guy is put up in a hotel. NBC, which owns a controlling share of Bravo, is milking the show's instant success for everything it's worth. While committed to keeping the show on Bravo, NBC has aired three complete "Queer Eye" episodes in primetime. The Fab Five had a two-night stint on The Tonight Show – including the opportunity to remake Leno and his set. They've been on MSNBC's new programs and are set to guest-star as themselves on the second episode of NBC's sitcom "Good Morning Miami" this fall.